Master’s student Bryan Moore spent his summer in the Mickey Leland Energy Fellowship (MLEF) Program at Los Alamos National Laboratory (LANL) where he helped simulate the flow of contaminants in water supplies. Recent incidents of water contaminiation, such as the water supply crises in Flint, Michigan, and Corpus Christi, Texas, have drawn attention to the need for improved methods for tracking contamination. 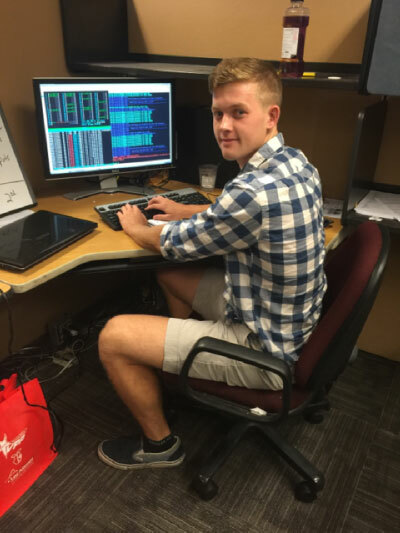 Student researcher, Bryan Moore, dedicated his summer to contributing to the contamination tracking as a participant in the U.S. Department of Energy’s (DOE) Mickey Leland Energy Fellowship (MLEF) Program. Alongside mentors Monty Vesselinov and Daniel O’Malley in the Earth and Environmental Sciences division at Los Alamos National Laboratory (LANL), Moore researched methods to speed up simulations that model the flow of water beneath the earth’s surface. “I researched applying machine learning approaches and search heuristics, like Artificial Neural Networks and Genetic Algorithms, to optimize fluid dynamics and contamination flow problems,” Moore explained. “The application can vastly speed up previous methods that solved these types of problems while dropping other computational expenses." Moore’s algorithms mapped the complex functionality of flow through various types of subsurface media. “For example, if a pond was contaminated and you want to know when and where the contaminant will go, my model could hypothetically help you,” Moore said. It also operates in the reverse direction and can identify the origin of a pollutant. With multiple applications, the model could be utilized in various contamination situations. "I applied for the program because it seemed like a perfect blend between my interests of researching at a high level and aiding in the complex search for more efficient energy," Moore explained. "I believed this program would be a huge step in my quest to be on the front lines of cutting-edge research in the energy sector." After his participation in the program, Moore returned to the University of Southern California to complete his master’s degree in chemical engineering. He plans to pursue a doctoral degree in materials science and then do research at a major corporation or a national laboratory. Regardless of the location, Moore’s ultimate goal is to utilize the skills he gained from his university education and the experience in the MLEF program to aid in the development of green energy materials.